A final word from DAN for 2016. I'm delighted to share details of the 2017 DAN Professional Development workshops. 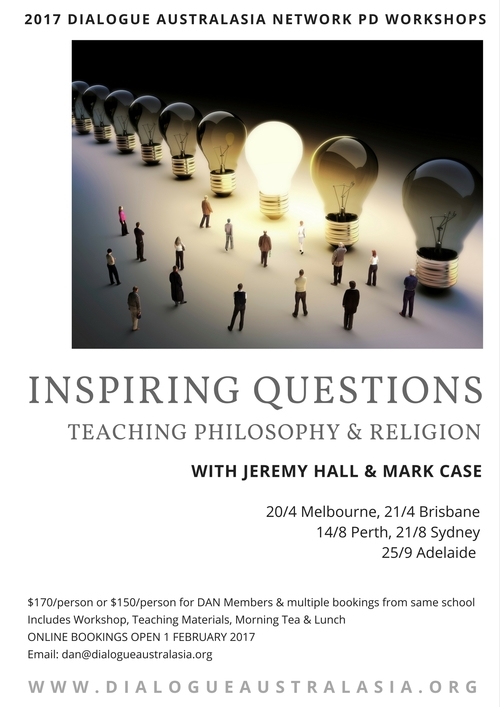 Outstanding educators, Jeremy Hall and Mark Case, will present 'Inspiring Questions: Teaching Philosophy & Religion.' Bookings will open in Feb 2017 - see below for more details. 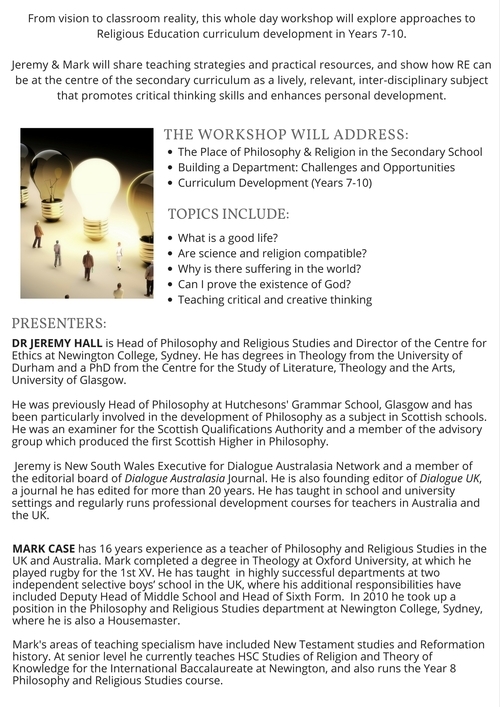 To avoid any confusion, please be aware that PD workshops offered by Dialogue Education in 2017 are entirely independent of DAN, and any enquiries should be made directly to Matthew Wills. The May 2017 Issue of Dialogue Australasia Journal will explore Tough Ethical Questions. As always, if you have any suggestions for potential contributors, or feel inspired to pen something yourself, I'd love to be inundated with ideas! From Anthem, by Leonard Cohen. (Rest In Peace Champion of our cracked imperfections). 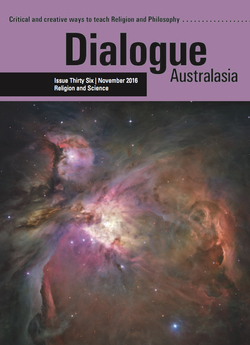 If you haven't received the November issue of Dialogue Australasia, or would like to order extra copies, please contact the DAN EO. Don't forget to check out additional resources for teaching about Science and Religion on the DAN website. 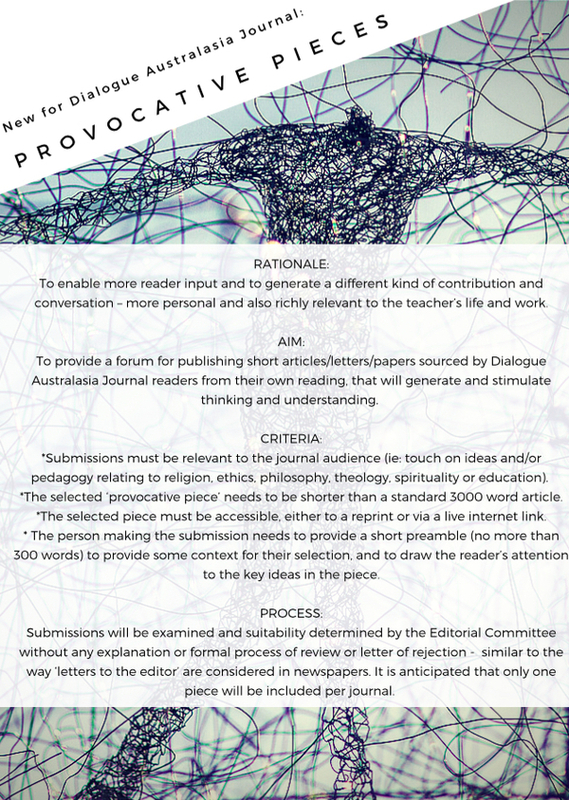 Readers of Dialogue Australasia might recall the introduction of a new segment, 'Provocative Pieces' - where we invited you to share a short piece from your reading as a source of stimulation for colleagues. You can read more about this below - and look forward in advance to hearing from you! 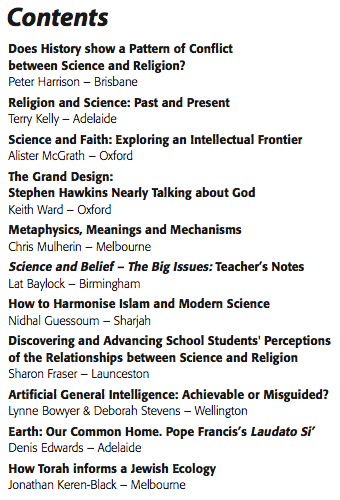 'Tough Ethical Questions' (May 2017 Issue of Dialogue Australasia) by 31 March 2017. The RE-searchers: A New Approach for RE in Primary Schools, 2015. The RE-searchers approach encourages pupils to think about the significance and effectiveness of different methodologies and methods of enquiry in RE. 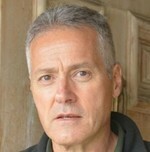 To make these accessible to young children, some of them have been personified as cartoon characters. A new resource: The RE-Searchers Approach: A quick start guide with exemplar activities and units of work is now available as one of the outcomes of the RE-searchers curriculum development project. If you are looking for ways to help your primary students engage in the related dialogues about the nature of religion(s) and the best ways to learn about them, this would be a great resource to explore. The Buddhist Life Stories of Australia website is now live. Buddhism is Australia’s second largest religion, and has a long history dating back to at least the 1850s Gold Rush period, yet the life stories of prominent Buddhists in Australia have remained largely undocumented until now. A research team from Deakin University, in partnership with the national and state Buddhist Councils of Australia, and filmmaker Freeman Trebilcock, have begun to record interviews with Australian Buddhist leaders from diverse traditions to preserve their stories and to increase awareness of Buddhism in Australia. The video interviews are freely accessible at the Buddhist Life Stories of Australia website. Read more about how Arthur can support your teaching. The 2017 SLA Conference asks how literature and the arts can help to awaken an experience of the sacred: do the arts provide a common ground for people of different faiths and no faith to open themselves to the ineffable? There will be a special focus on the meditative traditions and practices of East and West and the ways in which they are often nurtured and supported by literature and the arts. Speakers include Laurence Freeman OSB, Shaykh Muhammad Mendes, Sasha Grishin, Rachael Kohn, David Tacey, artists Michael Galovic and Chelsea Adkins, and the ACU Choir. 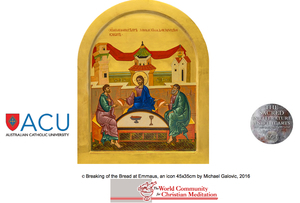 The conference will also feature an exhibition of traditional icons and contemporary religious art by Michael Galovic, alongside works by Chelsea Adkins.